Purkinje neurons are found in the cerebellum and have unique fan-shaped dendrites that align along the functional subdivisions of cerebellar neural circuits. Researchers led by Dr. Mineko Kengaku from RIKEN Brain Institute and Kyoto University in Japan, explored the mechanisms involved in this flat branching by using Imaris software to analyze Purkinje cells in three dimensions. 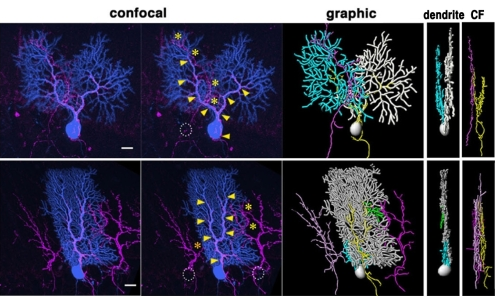 The branching patterns, or arborization, of dendrites are critical in determining neuronal connectivity and signal integration. However, scientists do not understand what regulates the patterning of monoplanar Purkinje cell dendrites. To study the process, the researchers used laser-scanning confocal microscopy to image fluorescently labeled mouse Purkinje cells in developing cerebella at various stages. They first imaged the whole cell by acquiring serial sections with a frame size of 512×512 pixels at 1 micron intervals and then used Imaris, the most powerful and versatile 3D and 4D image analysis software solution on the market for researchers in life sciences and its Surpass view to reconstruct a 3-D image from the confocal z-series. This was followed by using the AutoDepth function of Imaris Filament Tracer to generate a three dimensional rendering of each dendritic branch. Figure 1: Using Imaris, the researchers were able to examine climbing fiber (CF) associations (pink) to multiplanar dendrites of Purkinje cells. Confocal and Imaris (graphic) images of climbing fibers and a multiplanar Purkinje are shown. The top row and bottom row show different cells. Images reprinted from PLoS ONE. “The AutoDepth function was powerful for creating 3D renderings of dendritic branches. It semi-automatically detects the central axis and thickness of fluorescent signals and computes the correct position for manual tracing in the third dimension,” said Dr. Kengaku. Tracing cannot be used with typical z-stack confocal images if two signal peaks of different depths overlap, so the researchers traced multiplanar cells at an angle where there was no overlap between the main and minor branches. They did this by rotating the 3-D images 360 degrees and carefully editing individual renderings for correct positioning in the third dimension relative to the actual confocal image. By looking at the mouse Purkinje cells in three dimensions they were able to show that the cells obtain their characteristic monoplanar configuration after undergoing dynamic dendritic remodeling during the third postnatal week. Prior to this remodeling the cells branch into multiple sagittal planes. “Our results suggest that the monoplanar arborization of Purkinje cells is coupled with functional development of the cerebellar circuitry,” said Dr. Kengaku. Figure 2: This Purkinje cell (blue) extends dendrites in three distinct sagittal planes (arrows in the coronal view) and receives inputs from at least three different climbing fibers (asterisks, filled and blank arrowheads in the sagittal view). The boxed region in the left panel is enlarged in right panels, with the far right panel showing . In addition to the ascending climbing fiber in the proximal part of the dendrite (asterisks), a climbing fiber from a different origin is closely apposed to the distal part of the dendrite (arrowheads). Images reprinted from PLoS ONE. Research Paper: Kaneko M, Yamaguchi K, Eiraku M, Sato M, Takata N, et al. (2011) Remodeling of Monoplanar Purkinje Cell Dendrites during Cerebellar Circuit Formation. PLoS ONE 6(5): e20108. doi:10.1371/journal.pone.0020108.